1918 sees the centenary of the end of the First World War. The huge scale of loss of life in the war led to a number of changes in commemorative practices. We will be marking this anniversary with a series of Monuments of the Month. By 1918, many communities had already started planning memorials to the local dead. Some built community halls. The parish of Moelfre on Anglesey installed street lighting. For most, though, a memorial stone listing the names of the dead was part of the commemoration. We will be featuring several of these in the course of the year. We begin, though, with Jean Wilson’s study of two individual monuments in Norfolk which are in many ways typical of the new restrained style of commemoration. Loddon, Norfolk: Francis Edward Cadge †1915 at Gallipoli; William Cadge †1915 at Loos. The War to end all Wars, which led to the eventual break-up of the Empire, posed enormous problems of commemoration. Although individual monuments tended to be eschewed in favour of mass commemoration, some families did, nevertheless, choose to put up memorials to their children outwith the community war memorial or Lutyens-inspired restrained and aniconic model. This, from Loddon, Norfolk, commemorates two sons of a local solicitor. The second son (and second to die) had evidently served the Empire, since after leaving Haileybury (a school designed to produce executives of Empire which had its origins as the school of the East India Company) he went to Ceylon, whence he returned in 1914 and joined up as soon as the war started; the fourth son (but first to die) was evidently a professional soldier – though note that he had served in India and Mauritius. The memorial (whose sculptor I have been unable to discover – no signature is visible) is evidently based on a photograph/ photographs, although the uniforms project over the frame at the bottom, giving the impression that the young men are stepping into the church space. This monument is restrained, but privileges religion, duty and patriotism, while giving a naturalistic representation of the deceased: we know what these young men look like, they invade our consciousness as they escape from their frame. This is a monument about sacrifice, rather than triumph. While both brothers have their names inscribed on the memorials at Gallipoli & Loos, no grave location is given in either case: they do indeed embody the sentiments of Brooke’s The Soldier – a corner of a foreign field that is forever England. This may have fed into the parents’ decision not simply to commemorate them, but to make such a point of their presence. 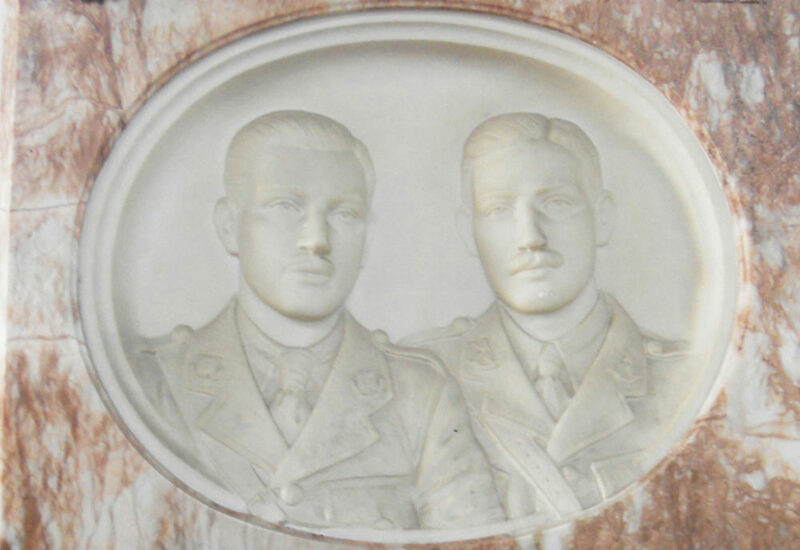 And, of course, this is a propagandistic memorial: these are ordinary young men, known to and no doubt recognised by the congregation in their local church, who can only be with them as ‘social bodies’ because they have done their duty & died.